How to beat the hot summer heat ??? 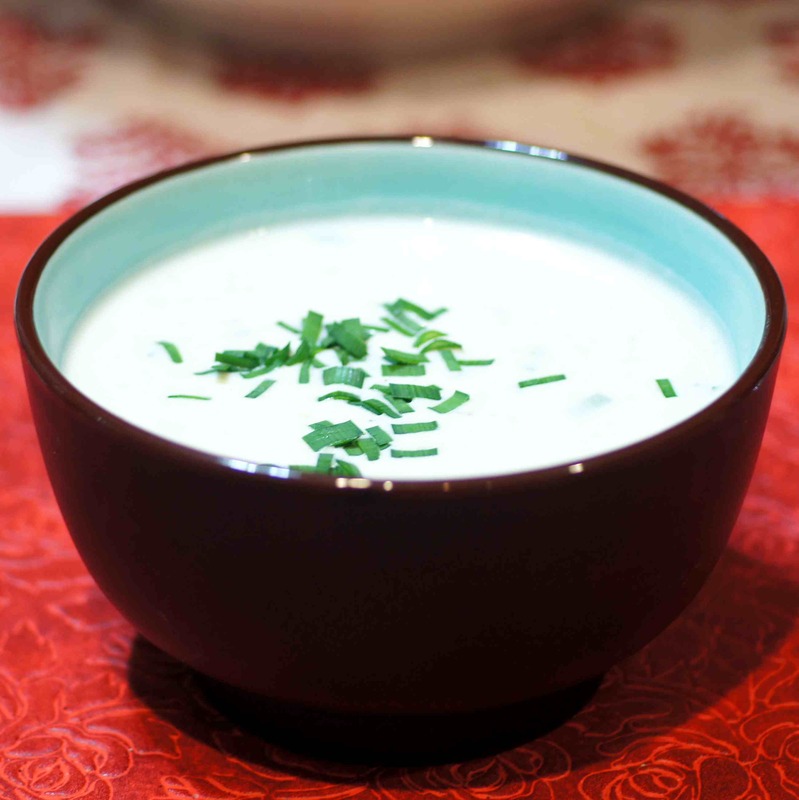 Try cold soups like this cold potato soup, “Vichyssoise.” Are you listening to me?? You should because this is not only a classic but it is the perfect dish for those dog days of summer when the heat just beats you down. Staying with cool and refreshing summertime meals, we served this with the broccoli salad for a very nice, satisfying dinner. 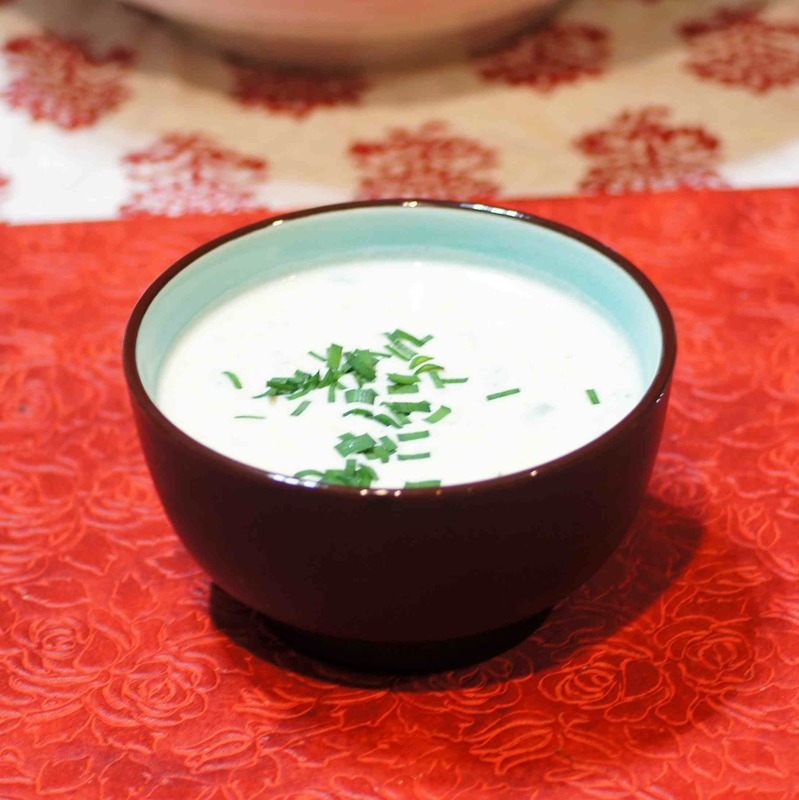 Now, vichyssoise is one of the very first soups I learned to make back in 1973. I have loved vichyssoise since I first made it. It’s remarkably simple, luxurious and a perfect summertime soup. 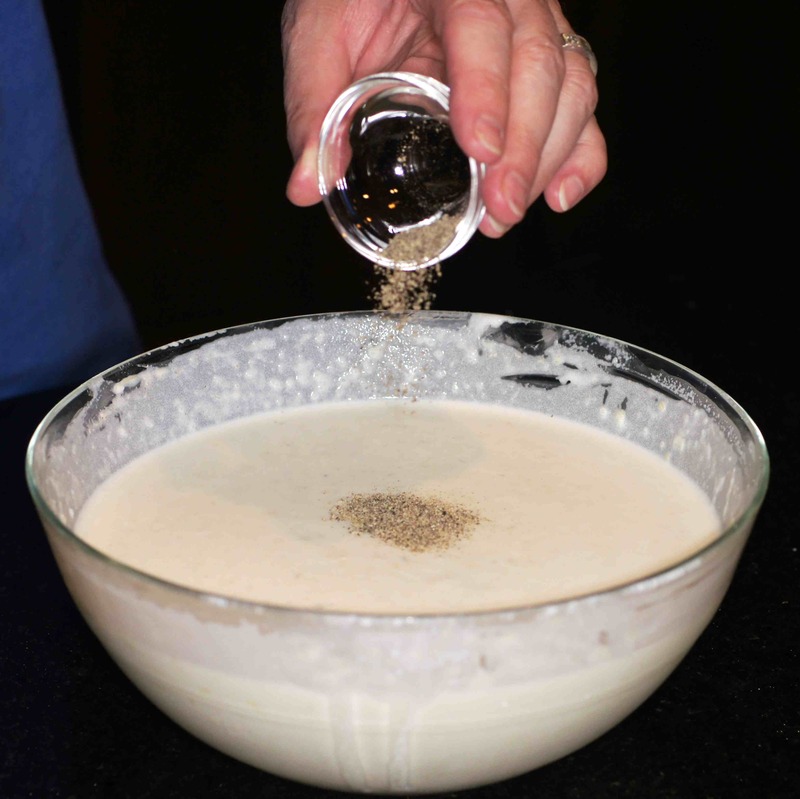 Further, all of the ingredients are readily available and inexpensive. This history and origin of vichyssoise is somewhat debatable. 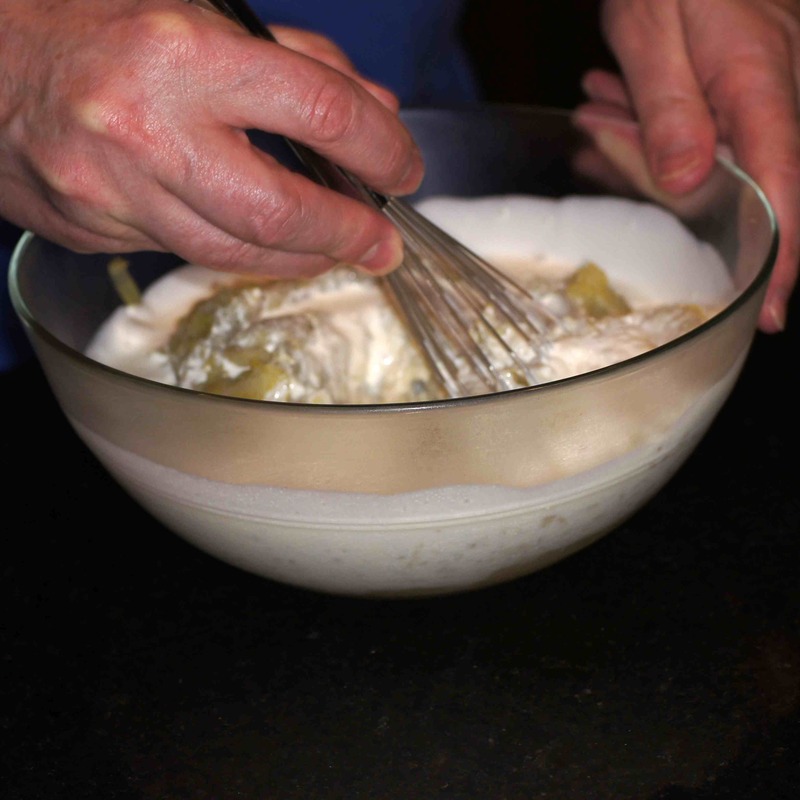 If you’re a Julia Child fan, she remarks in Mastering the Art of French Cooking that vichyssoise is an American invention based upon potage parmentier (potato soup). The first cookbook I ever actually read (and studied) when I was beginning my culinary journey was the Escoffier Cookbook, the American edition of Guide Culinaire. I actually learned a lot of my culinary style from this book as I have cooked at least 1/3 of the recipes in the book. I have two copies now: a newer 1989 edition; and the original one I purchased in 1973. The original book is food stained; the corners are bent; the back spine has separated; the cloth covering is frayed and water stained; the paper cover jacket has long since disappeared; some recipes have my personal notes; some pages have come unglued; other pages are torn; and over the years some have even been lost. It was a greatly used, studied, loved and cherished book. To this day even in its current condition with a newer copy, I just cannot get rid of this book. 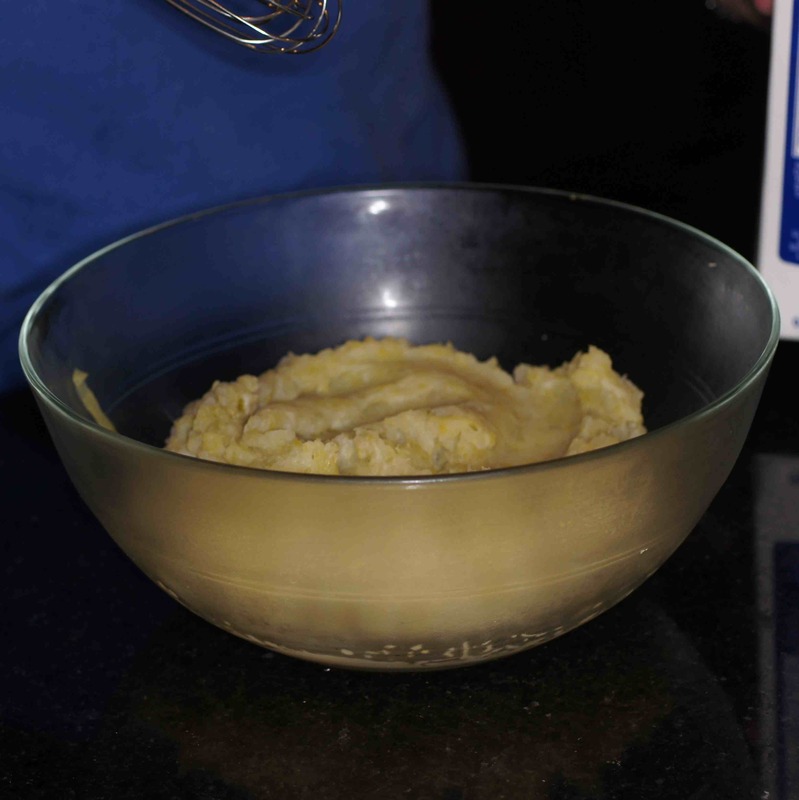 Nonetheless, in a 1903 edition of Guide Culinaire, there is a recipe for Soupe aux Poireaux et Pommes de Terre, dit a la Bonne Femme – puree of potato and leak soup. The difference between Soupe aux Poireaux et Pommes de Terre, dit a la Bonne Femme and Vichyssoise is Vichyssoise uses cream and is served cold and Soupe aux Poireaux et Pommes de Terre, dit a la Bonne Femme uses milk and is served hot. 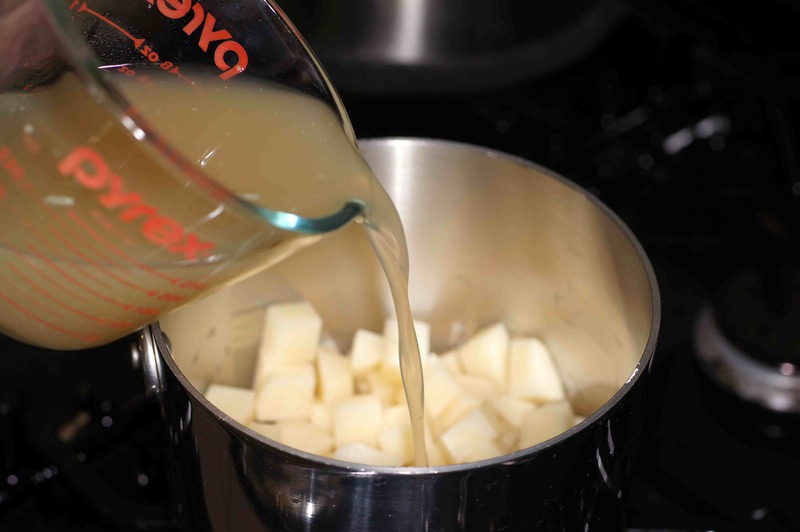 Many consider Soupe aux Poireaux et Pommes de Terre, dit a la Bonne Femme to be the foundation of Vichyssoise; ergo, it is of French origin. Still, there is another tale involving the infamous Henry VIII. Under this version of the origin of the soup, Henry loved potato soup and had it for dinner quite often. Given his paranoid nature, he always had numerous food tasters sample his food before he ate it. As such, his favorite potato soup was often passed from one taster to another. By the time it finally reached Henry, it was cold. Henry then decided he preferred cold potato soup. The most generally accepted story as to the origin of the soup is that it was created by Chef Louis Diat of the Ritz hotels. According to the story, in the days before air conditioning, the New York Ritz had a Japanese roof garden and Diat was constantly looking for dishes that would cool the patrons in the hot and muggy July and August weather. He remembered the simple bourgeois hot leek and potato soup his mother and grandmother made when he was a boy. He and his older brother cooled the soup by adding milk to it and loved the flavor imparted by the milk. Hence, on the rooftop of the New York Ritz, he prepared this same cold soup and called it “creme vichyssoise” after the famous spa located 20 miles from his home town of Bourbonnaise, as a tribute to the fine cooking of the region. Regardless of the origin or its history this is a great and classical soup. A friend of mine, however, views vichyssoise as merely cold potato soup. Ahhh, but vichyssoise is so much more. If you have never tried vichyssoise or never made vichyssoise, you definitely need to try this recipe, especially in these hot summer months. You won’t be sorry. 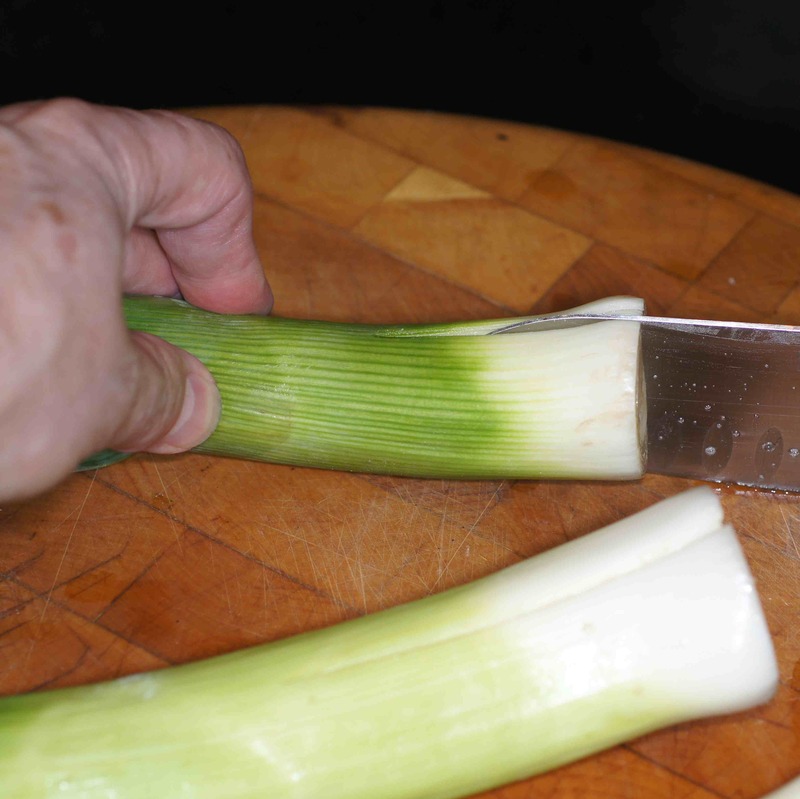 First things first, quarter the white and pale green part of the leeks leaving the upper green stalk intact. 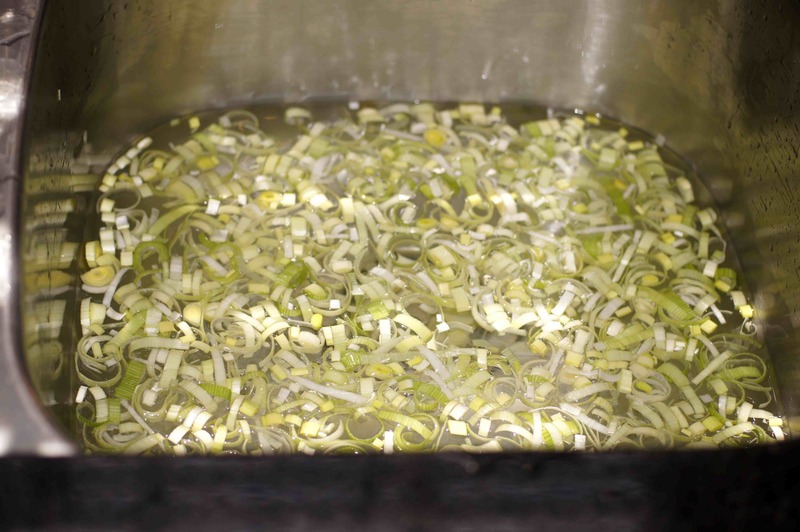 Slice leeks and wash in cold water. Cube potatoes and place in a pot. and salt. Now, remember I use homemade chicken stock with no salt. 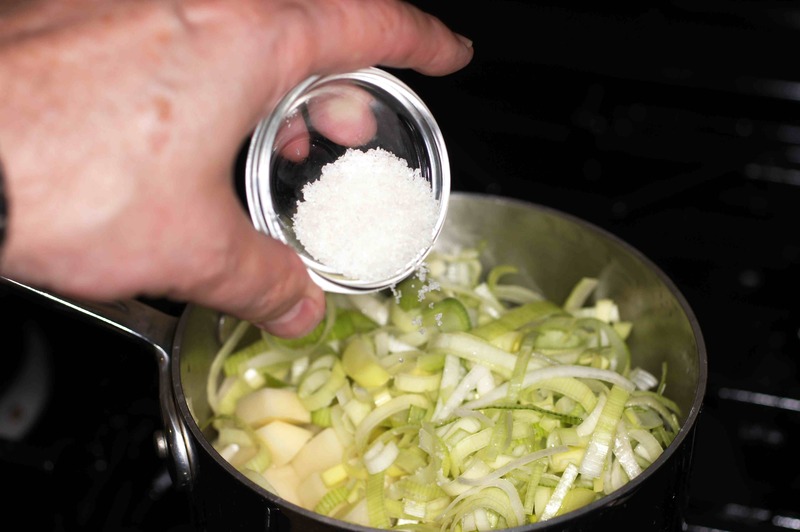 As such, I use about 1/2 Tbsp salt to this portion of the recipe. If you use canned or boxed stock/broth, check the seasoning before you add any salt. You can always add more salt but you can’t take it out. 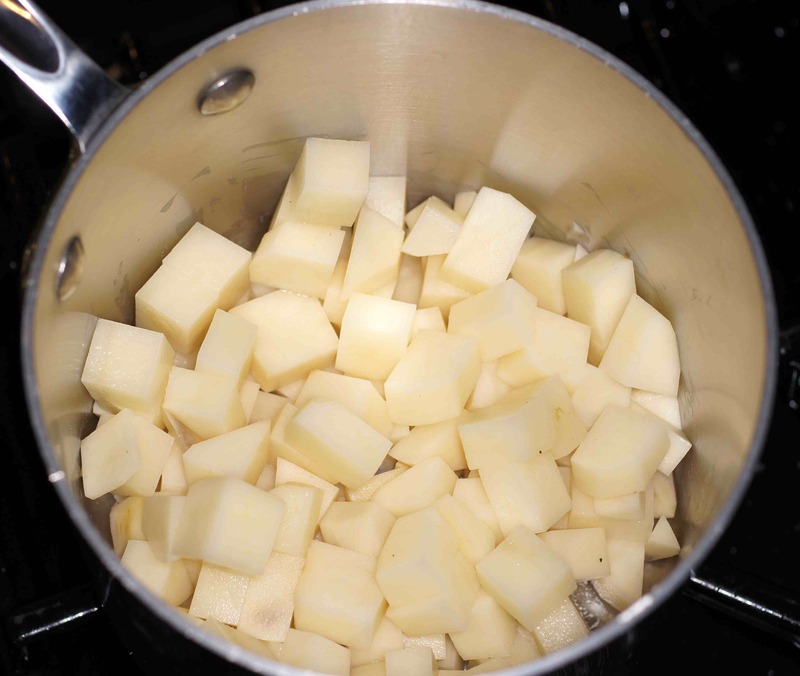 Now, bring mixture to a boil, then reduce heat to a simmer and cook for 30 – 35 minutes or until potatoes are soft. Remove from heat and run through a food mill (molina). Some people will advise you to run it through a blender until smooth. If you want the soup silky smooth then do so. I prefer the slightly coarser texture you get with the food mill. Do whichever you prefer. 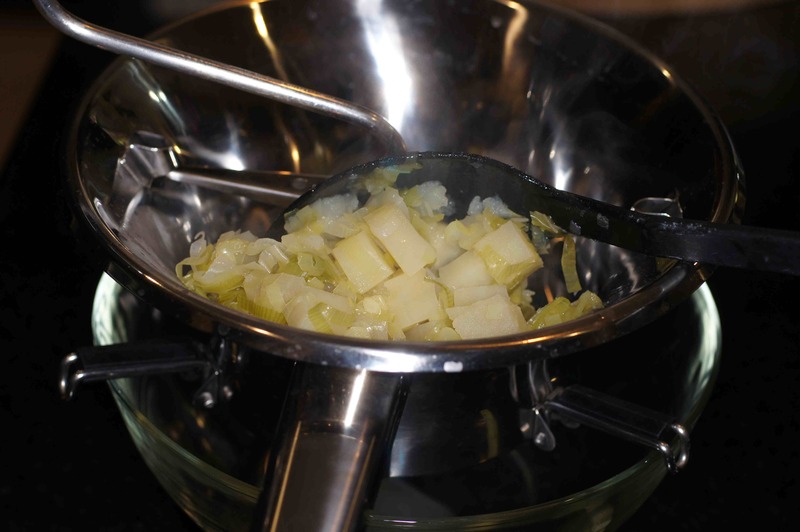 You will be left with a paste of potato and leeks, like this. Cover with plastic wrap and refrigerate for 4 hours. 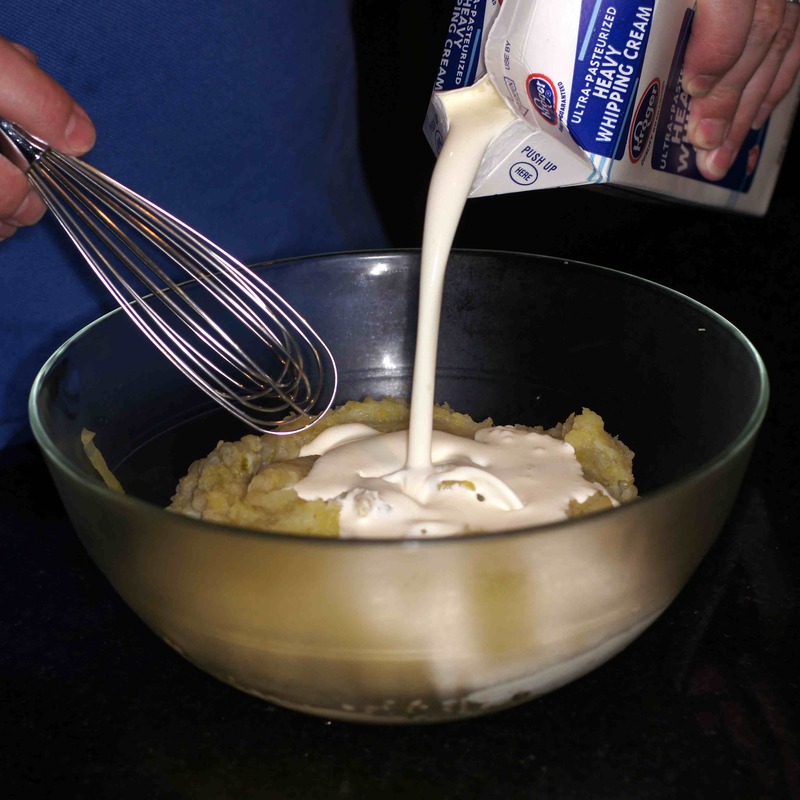 After 4 hours remove from the fridge and add the heavy cream. 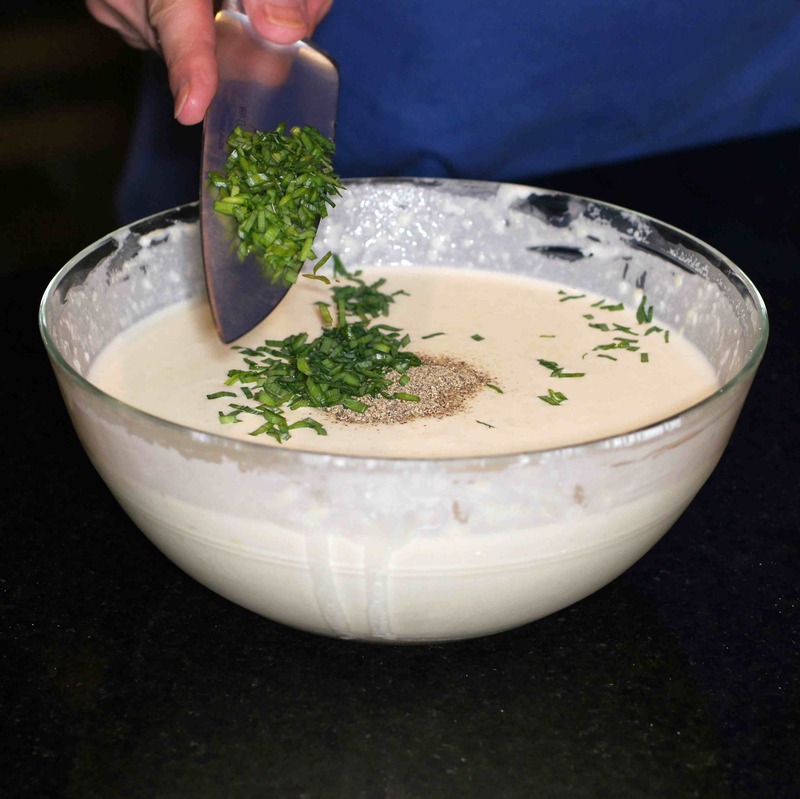 Whisk to incorporate, adjust seasoning as needed, ladle into bowls and sprinkle with additional chives for garnish. Serve & enjoy. I love the story! Great looking soup. Delicious soup recipe! I’ll have to try it. I really like both gazpacho and chilled borscht. So I’m sure to like this too! Thanks for your nice compliment. 🙂 If you like cold soups, this is a wonderful one to try. I’ve always wanted to make this – and now I’m going to ! A great job Richard ! I love the simplicity of this! Don’t think I’ve ever heard of this. 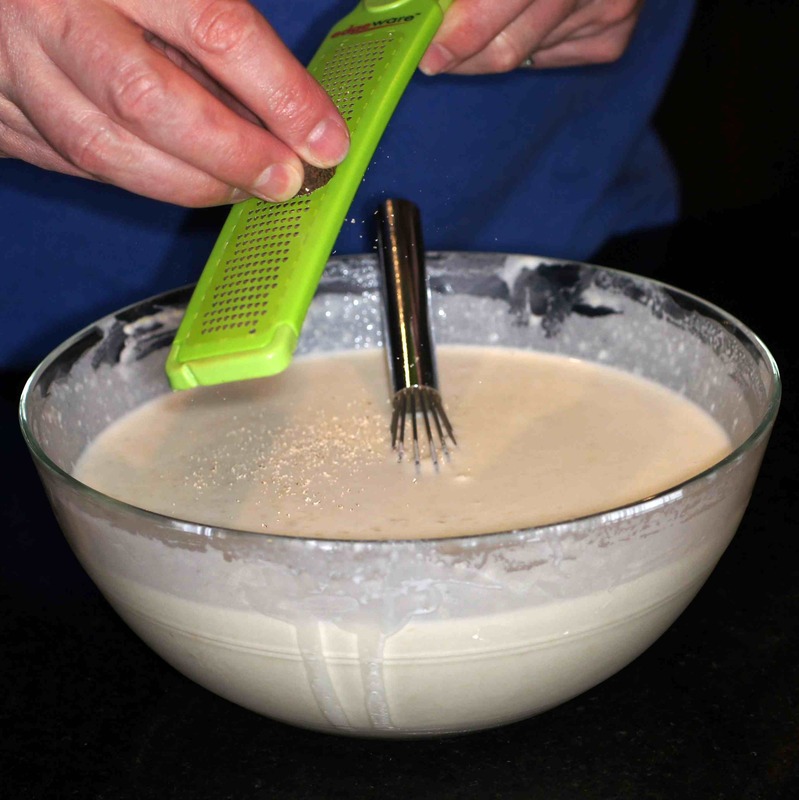 I like the recipe, the story behind it, and your step by step instructions. Excellent post, Richard. Glad you’re ‘back’. You never fail to impress me with your recipes, Richard. I appreciate your back stories too. I have an old and tattered, stained Homes and Garden recipe book my mom gave me in 1981 (published in 1979) that I love and cherish, and also The Encyclopedia of Cooking from 1985 that I refer to often for ingredients I am unsure about. Oh the joys of learning to cook! Such a journey. Thank you. 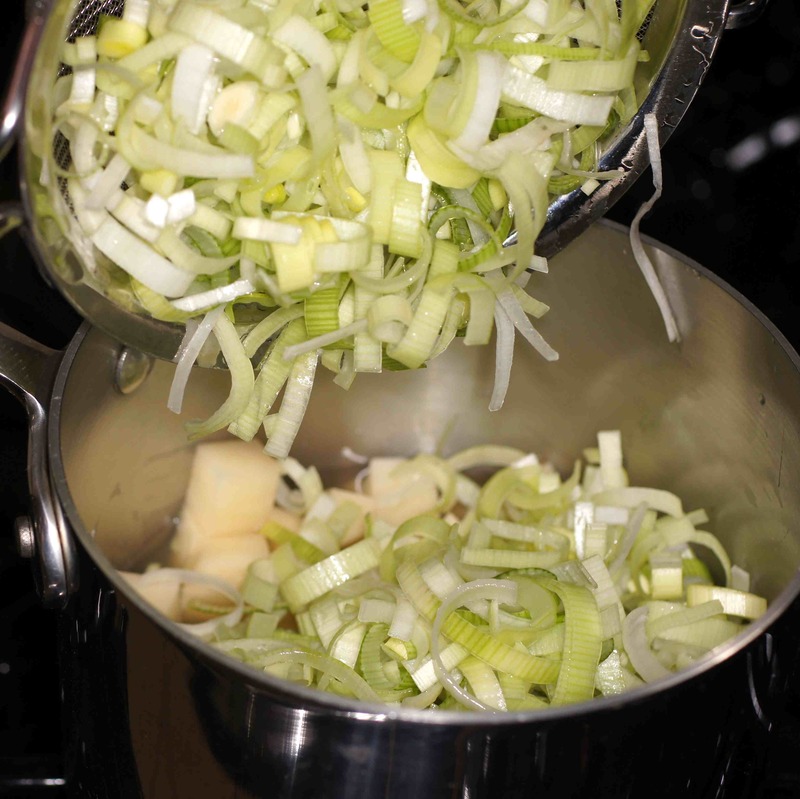 Decadent and delicious – I’m a big fan of Vichyssoise. Makes a great amuse bouche too! 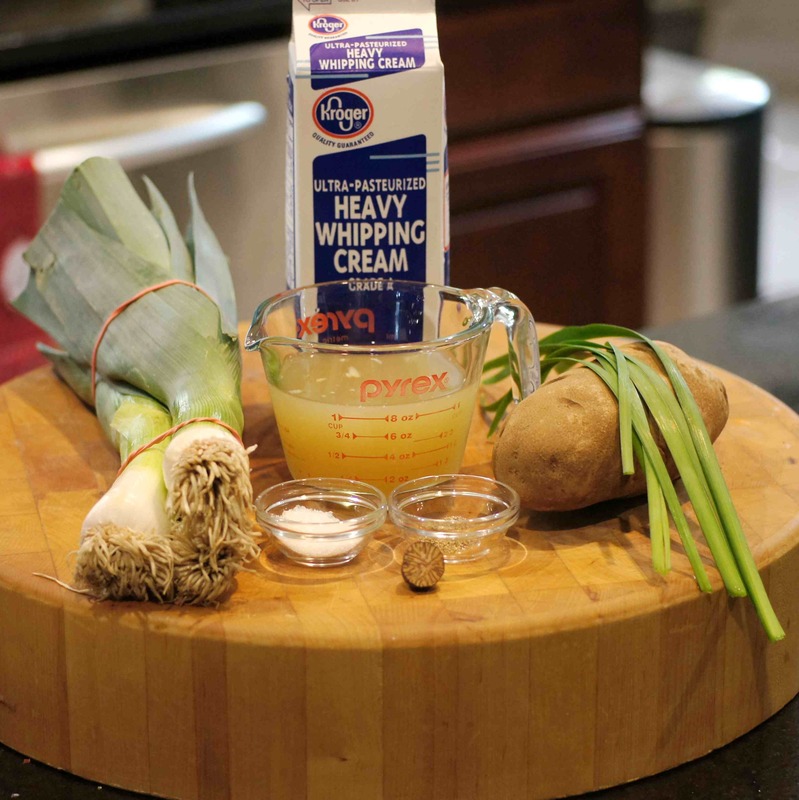 I absolutely love vichyssoise…the best I ever had at a restaurant was at Tavern On The Green. It was truly memorable. Hi, Andreea. Definitely give this a try while it’s hot. It’s so good the patrons of the New York Ritz had Chef Diat keep it on the menu year round, even in New York winters. 😮 I really like this soup but it is at its best in the summer.